The stories builds deliberately, weaving threads together until all Hell breaks loose and the reader is thrown into a maelstrom of action and revelation. I very much devoured this, rather than just read it, and highly recommend it to lovers of fantasy fiction. Spark and Carousel is wonderful. It’s magic and cities and brilliantly written characters. It’s loyalty and love and learning. It’s choices, and the echoes of those choices. It’s a boy having to deal with decisions that he doesn’t want to make, with power that he doesn’t want but can’t get rid of, with feelings that he isn’t sure what to do with. It’s a girl, a woman, trying to choose the path that will keep her safest, stepping between loyalties and loves and the simple practicality of trying to survive…. This is a fantasy story that has gripping characters, an increasingly enthralling danger, and a wonderful cast and world that makes it a pleasure to read and re-read. 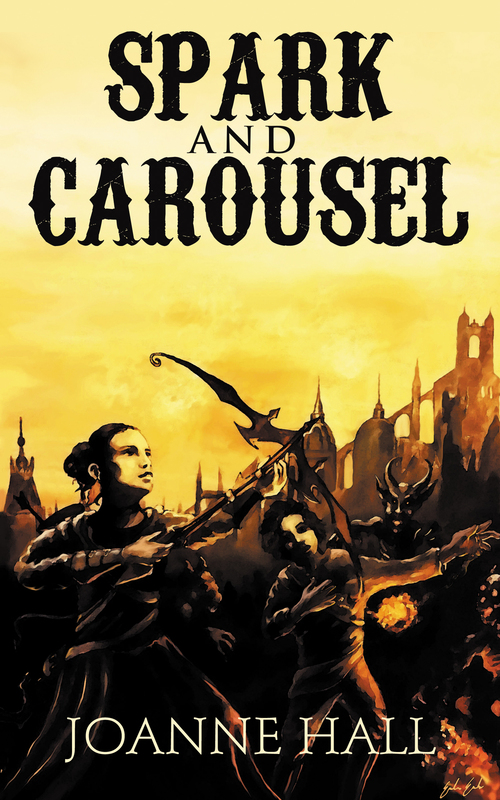 “In spite of its grim setting and the difficult lives of the characters, Spark and Carousel is not a depressing read. It’s one of those books that has cost me precious hours of sleep, and that I sorely miss now that I’ve finished reading it. In terms of the writing, I would put it on a par with the novels of Joe Abercrombie. There’s less of a sense of humour in Spark and Carousel, and the characters, while memorable and charismatic, are not quite as larger-than-life as Abercrombie’s, but they feel more real and believable as a result. If I had to sum it up in one glib sentence, I’d describe it as “Juliet McKenna meets Joe Abercrombie”. A solidly entertaining, good book for those who enjoy reading fantasy and don’t mind grimdark elements.